In searching my computer and hard drives for pictures and information from my visit to the Burgoyne’s Cove B-36 crash a few years ago, I have discovered a few items that I forgot. As computers and projects have changed, my filing system has changed with it. For instance, everything for my thesis is together, but information from other sites might be scattered in other folders. Plus, keeping information together based on when I visited the site is not as useful to me anymore as organizing it by location. So, it just looks like I am going to have to invest in a new hard drive to be dedicated just to aviation in Newfoundland and Labrador and figure out where I put all of my digital information. Similarly, it would be nice to eventually make digital copies of many of the documents that I have, such as the RCAF reports. Many many tasks for the future. Today I plan to share a couple of crash cards that were given to me a couple of years ago while I was looking for information on RCAF Hurricane 5496. I have the report for the USAAF A-20 with which it collided, but all I could find from the Hurricane was the crash card. The aircraft were conducting a mock dog-fight when they clipped wings and crashed. As seen below, the pilot of the Hurricane survived, but all USAAF personnel on the A-20 (Boston) were killed. 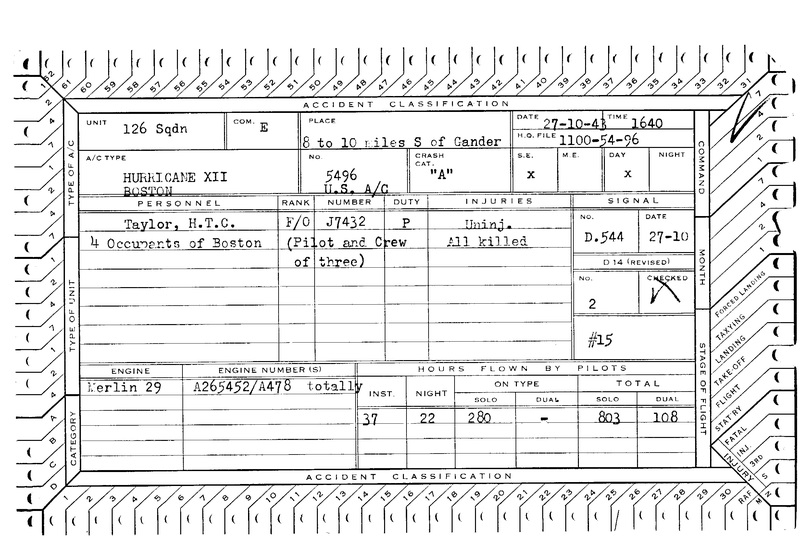 Crash card for RCAF Hurricane 5496 and USAAF A-20. From Walker 2012. 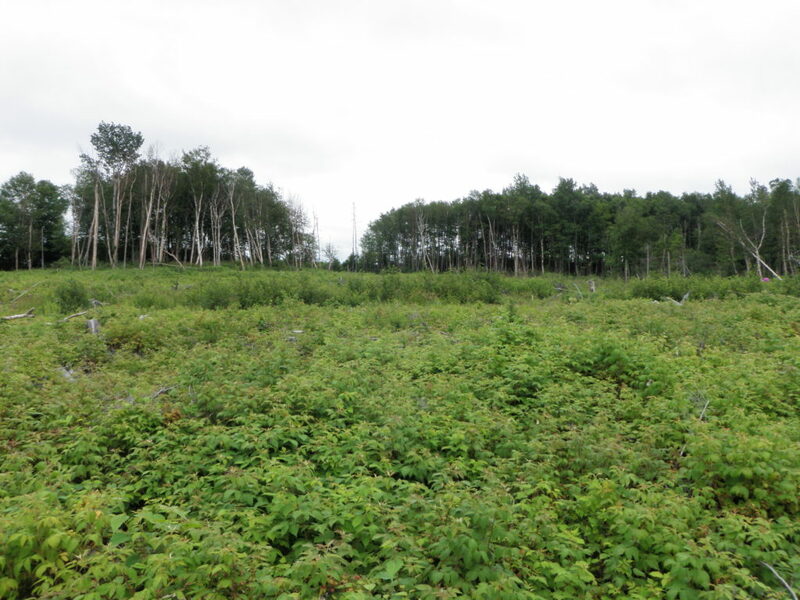 I have visited the site where this Hurricane crashed, but it was removed after the incident, and any further traces of it were most likely removed when the Gander Airport runway was expanded and the pond that the aircraft crashed in was drained. An archaeological investigation has been done on these sites, and will be posted at a later date. Image of RCAF Hurricane 5496 taken by the USAAF during the investigation. From McGlade & Wilkins 1943. The aircraft has since been removed and the pond drained, but the landscape still has similar characteristics to the original crash site. Photo by author, 2010. 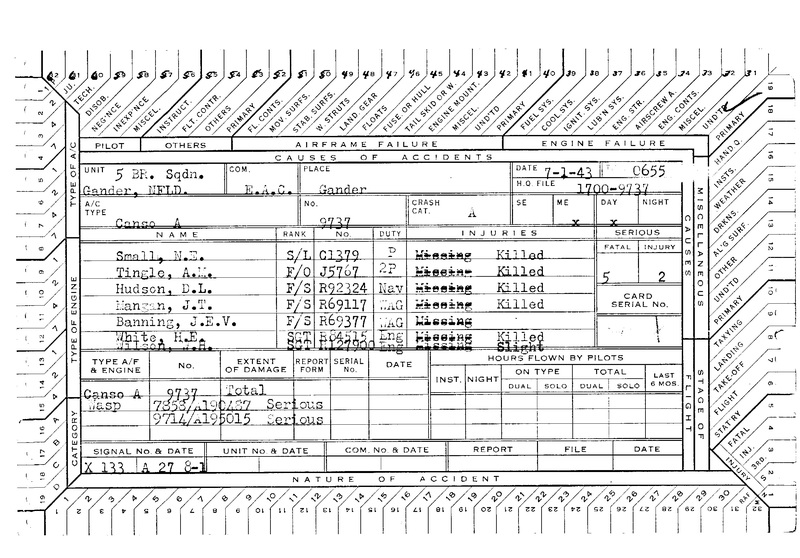 Another crash card I located relates to another Gander incident which I have researched. RCAF Digby 742 crashed due to poor weather, killing all on board (Heakes 1941). 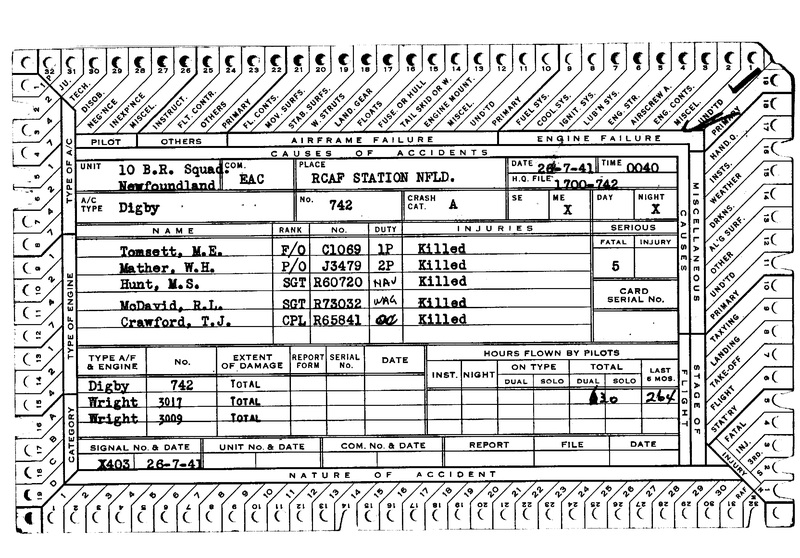 Crash card for RCAF Digby 742. From Walker 2012. 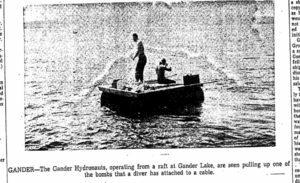 As this was the second incident out of Gander resulting in fatalities, it was determined that further incidents could be expected and a cemetery was necessary. The pilot and crew of this aircraft were the first buried in the Commonwealth War Graves in Gander (Pattison 1943). A more detailed report can be found here. 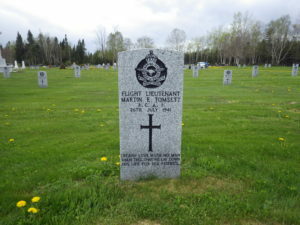 Gravesite of Flight Lieutenant Martin E. Tomsett in the Commonwealth War Graves, Gander. Photo by author 2014. The next two, I have not visited. One is lost in Gander Lake, and although people have been searching for it, I have not yet heard that they have found it (Ansty 2014). Crash card for RCAF Liberator 589. From Walker 2012. 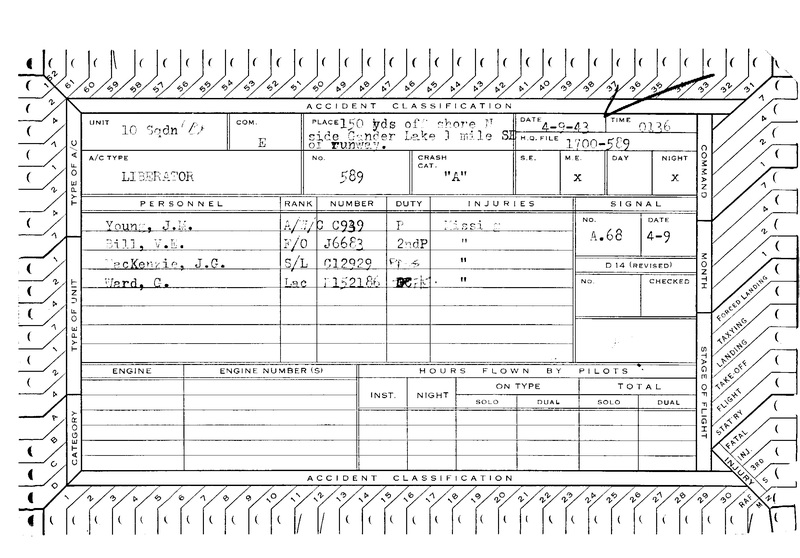 I do have the full report for this incident, but have not had a chance to try to interpret the photocopied microfilm. Eventually I will, and will share it. 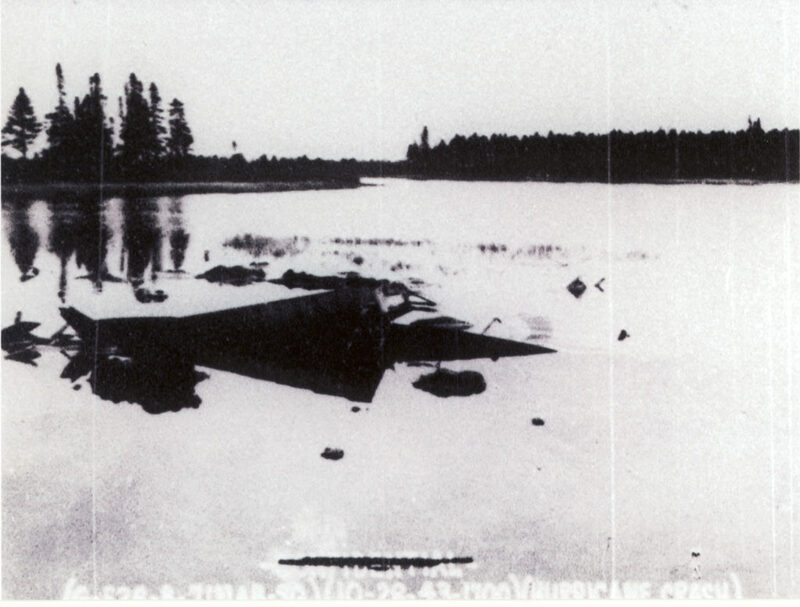 There have been many dives in Gander Lake, and many things dumped in the lake after the war, but the B-24 has yet to be located. Image from The Daily News 1961. Ordered by RCAF as a Catalina, equivalent to PBY-5. Order converted to amphibian before completion. Renamed Canso on 22 December 1941. Served with No. 5 (BR) Squadron from 16 December 1941, in Nova Scotia, Newfoundland, or Quebec, coded “E”. Seen at Mt.-Joli, PQ, late 1942, with full code “QN-E”. With this unit at Gander in January 1943, being flown by a crew of No. 167 Squadron, and famed Hudson pilot S/L N.E. Small, DFC, on mission to determine maximum useful range of Cansos over the North Atlantic. Took off at 10:00 AM on 7 January 1943, at maximum weight, and soon struck turbulence. Struck trees near Gander Lake, then crashed and caught fire. Wreckage not sighted for several days. 4 fatalities, including S/L Small, 3 survivors. Crash card for RCAF Canso 9737. From Walker 2012. Beyond this, the site has been visited, and parts have been removed. I have heard conflicting stories, but from what I can tell at least one wheel has been taken from the site and may have been used by the Forestry Department to repair one of their aircraft. 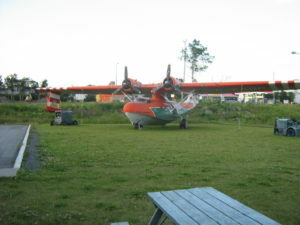 The PBY Canso (Catalina) outside the North Atlantic Aviation Museum. Photo by author 2009. 2014 Divers to Search for Plane Wrecks in Gander Lake. The Telegram, 04 July 2014. 1943 War Department U.S. Army Air Forces Report of Aircraft Accident. War Department, Gander, Newfoundland. Available at http://www.accident-report.com/. 1943 Early Days at Gander, The Gander, December, 35-36. 2012 Canadian Military Aircraft Serial Numbers, <http://www.rwrwalker.ca/RCAF_9701_9750_detailed.html> (accessed 26 April 2016).